Welcome To The Fountains Apartments. A Refreshing Change of Pace. Welcome to The Fountains, where the grand water fountains that inspire our name set a tone of serenity for the entire community. Feel yourself slow and relax as you take in each woodland and water-scape view. Enjoy the comfort of your spacious, contemporary apartment; inviting swimming pool, and private outdoor living areas. When you're ready to pick up the pace, Grand Rapids' best dining, shopping and entertainment are just minutes away -- as are all major expressways, the award-winning Forest Hills Schools, downtown attractions and the Gerald R. Ford International Airport. Beautiful greenery surrounds the one and two bedroom apartments at The Fountains. You can relax outdoors around the pool lounge area and the landscaped courtyard. Other services such as concierge, package receiving, and on-site maintenance are available. 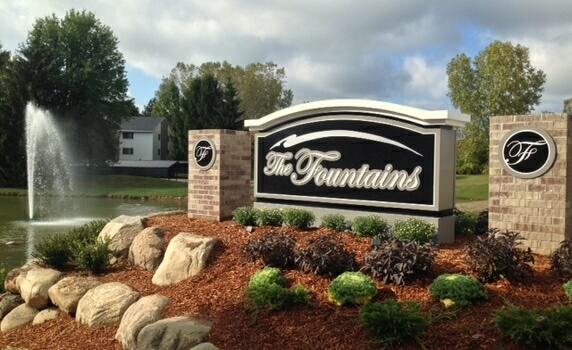 Call today and speak with a friendly team member for more details about the apartments at The Fountains.